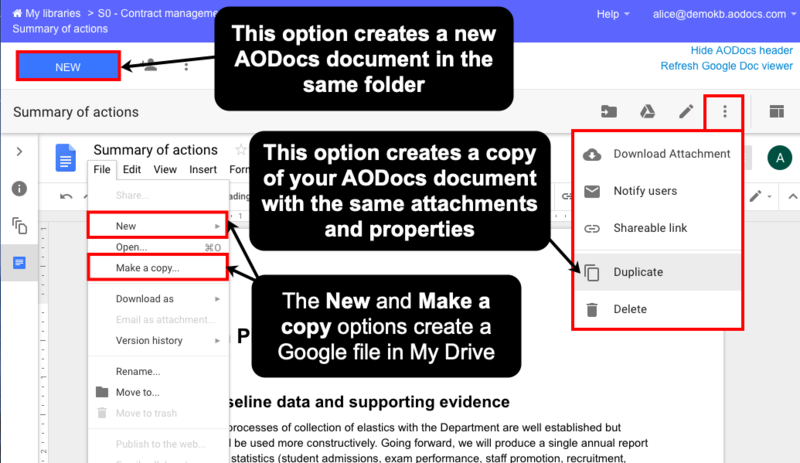 There are some minor limitations when working with Google file attachments (Docs, Sheet, Slides, Drawings and Forms) in the AODocs document editor, in all types of library. 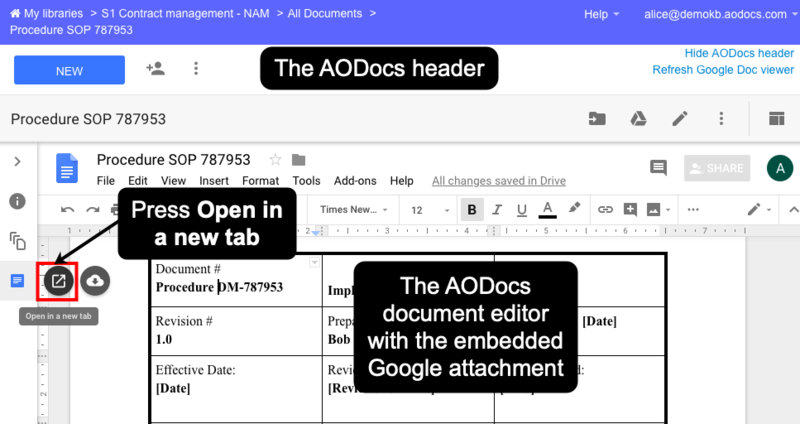 When you open any type of attachment in AODocs, it is displayed in the AODocs document editor in an iframe, under the AODocs header. There are some minor limitations when working with Google file attachments in the AODocs document editor. If you open your document in a new tab, most of the limitations no longer apply. In addition, you can access many of the limited features directly from the AODocs header. The Share button is grayed out and isn't available in the AODocs document editor. To manage sharing permissions, use the Edit document or folder permissions button in the AODocs header. Learn more: What are permissions in AODocs? The File > Move to trash option is grayed out and isn't available in the AODocs document editor. To delete a document from your library, open the More actions menu in the AODocs header and select Delete. The options Email as attachment... and Email collaborators... are grayed out and aren't available in the AODocs document editor. Open the attachment in a new tab to bypass this limitation. The File > Publish to the Web option is grayed out. It isn't available in the AODocs document editor because only the owner of a document can publish to the web in Google Drive. To publish a document, use the Publish to the web or Publish to the domain option in the AODocs More actions menu. – The Publish... options are available only in Team Folders and Security Folders. They aren't available in Document Management libraries. – Only library administrators can access the Publish... options. The Insert > Image option isn't available in the AODocs document editor. Open the attachment in a new tab to bypass this limitation. 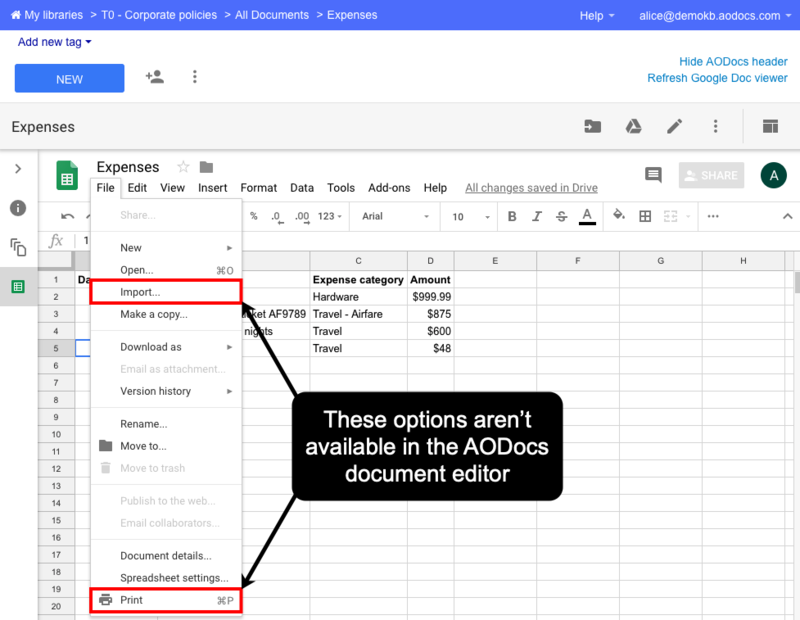 In Google Sheets, the File > Import and the File > Print options aren't available in the AODocs document editor. Open the attachment in a new tab to bypass this limitation. In an AODocs document with a Google sheet attachment in which there are protected cells, only the user who checked out the document can modify the protected cells. Other users with edit permissions on the protected cells can't edit the protected cells, but can edit the rest of the spreadsheet. Learn more: Force check-out / check-in when editing documents. HTML view: in Google Slides, the HTML view (accessible via keyboard shortcut) isn't available in the AODocs editor. Open the attachment in a new tab to bypass this limitation. 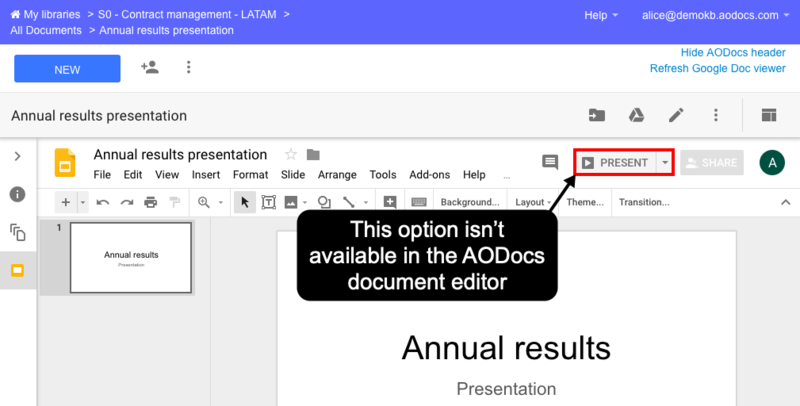 Present feature: in Google Slides, the Present feature isn't available in the AODocs document editor. Open the attachment in a new tab to bypass this limitation. When you add suggestions in Google file attachments in the AODocs document editor, they don't have the Accept and Reject buttons. Open the attachment in a new tab to bypass this limitation. 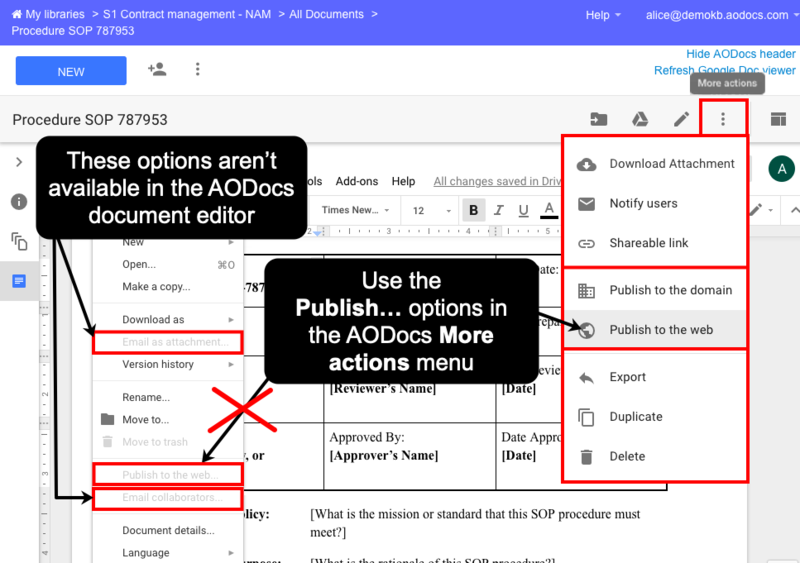 Add-ons that use a side panel, such as the Google Docs Table of contents add-on, don't work in the AODocs document editor. Open the attachment in a new tab to bypass this limitation. When you select File > New in a Google file attachment in the AODocs document editor, a new tab opens with a new Google file, which you can name and modify. However, the new file is created in your My Drive and isn't managed by AODocs. You can move or import the file into AODocs. 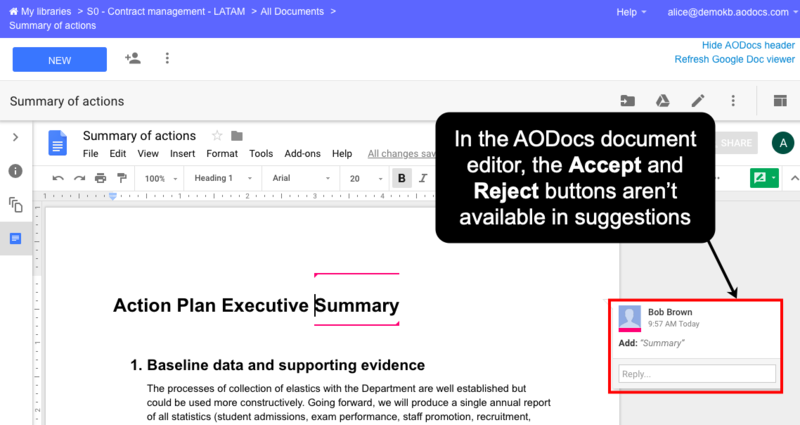 To create a new document in the same AODocs folder, press the New button in the AODocs header. When you select File > Make a Copy in a Google file attachment in the AODocs document editor, a copy of the document is created and opens in a new tab. However, the copy is located in your My Drive and isn't managed by AODocs. You can move or import the file into AODocs. 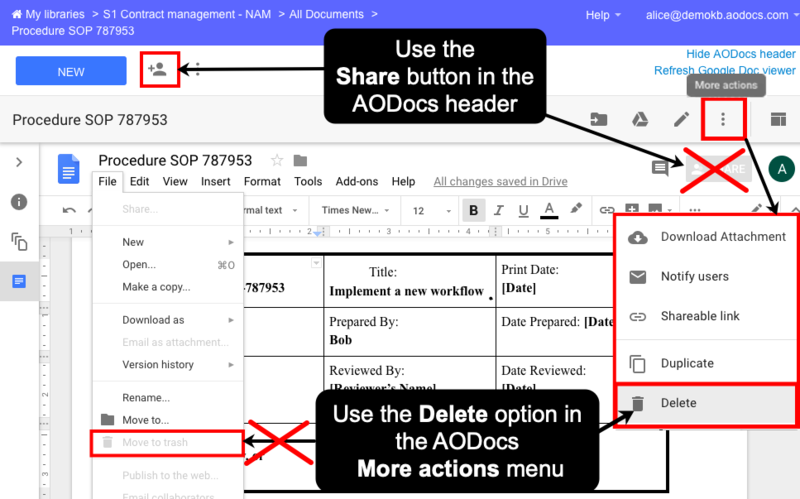 To copy an attachment from the AODocs document editor, open the More actions menu in the AODocs header and select Copy document. This copies all the attachments and properties of the AODocs document, if they exist. These features can be performed only by the script owner: the storage account. Tips: We recommend using separate App Script files instead of an attached Apps Script. 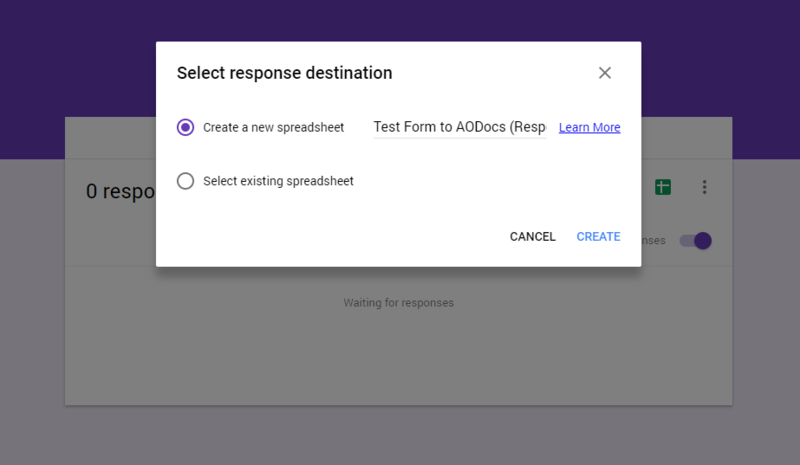 When working with Google Forms, you have the possibility to select a Google Spreadsheet as the destination of the responses of the form. Once selected, the spreadsheet and the form are linked (through their unique ID).